Park at the small parking area at the end of the public road ¾ mile beyond Makendon (NT794085) in Upper Coquetdale. Head south down the road for a very short distance and, before turning left to cross River Coquet, head straight up rising rough track. At four fingered signpost follow, `Pennine Way Restricted Byway Dere Street` uphill. Continue on Dere Street/Pennine Way as far as Black Halls. 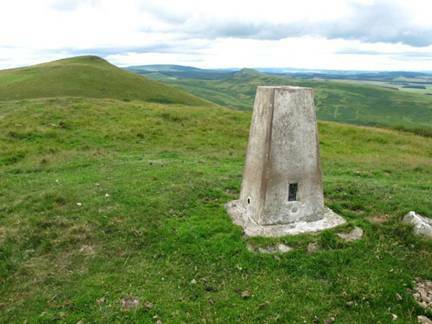 At this point leave Pennine Way behind and follow Dere Street over the border into Scotland. Continue with Dere Street gradually downhill making sure to take the path which skirts the south western slopes of Blackhall Hill. When Dere Street turns WNW just beyond Woden Law (adjacent to old building) continue straight ahead for 200 metres. Then head half right for another 200 metres to reach summit. Return via same route.